It strikes me as strange that this government haven't safe-guarded themselves by keeping the police forces around the country happy. As more and more people take to the streets in protest against the ConDem's slash and burn tactics, I would have thought that they are going to need the boys and girls in blue to maintain public order and keep party members safe. But with the various police forces up and down the country being faced with their own cuts, there's now a strong possiblity that some police officers will be joining in the protests. I suspect that this government would initially react by playing one force off against another - having the Met control a protest march by the Yorkshire Constabulary for example. Although apart from adding further to the North-South divide if they did do this, I think it would allow for the more anarchistic elements of protest to exploit this and capitalise on the divisions created. Not something that Mr C and his cronies would want I suspect! History has shown us that in this sort of situation governments start to manipulate information, creating an atmosphere of fear that allows for new 'emergency' measurers to be implemented. New laws are rushed through that allow for people's civil rights to be ignored or crushed under foot by those seeking to establish scapegoats for the situation that the country finds itself in ... seem familiar?! Let's hope that there's a whistle blower in government who is keeping watch for those signs of yet more political control appearing. Bulk orders for jack boots and black uniform material, the building of accessible internment camps to house those of us who are deemed too dangerous to be at large. It wouldn't really suprise me as to what lengths the present government will go in order to recreate society in its own distorted image. Keep a careful watch brothers and sisters. It's not a big step for us to be branded tomorrow's terrorists if this government has its way. 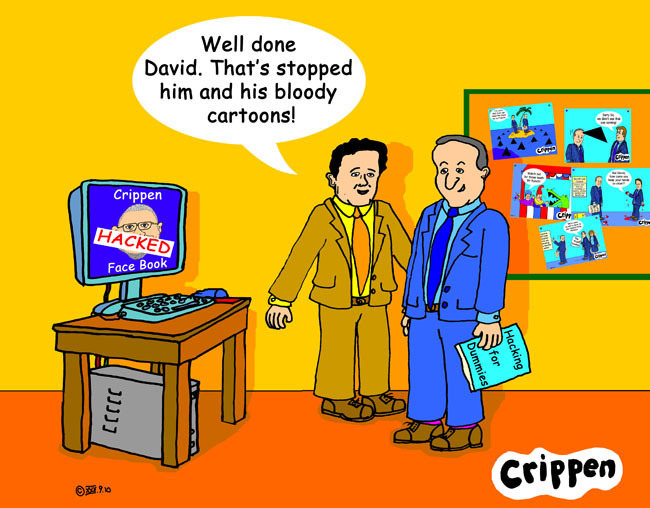 Many of you will know that I run a Face Book account as Crippen - Disabled cartoonist and post links to various disability related events that are going on as well as links to this blog and other disabled artists. 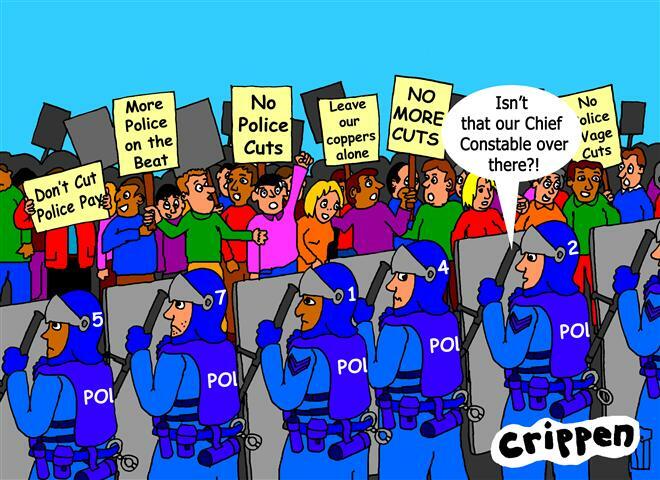 When the ConDem Coalition came into being I began to create cartoons that supported the stand being taken by groups and organisations who were protesting about the benefit cuts being planned. My posts carried cartoons created for the 3rd October Disabled People's Protest group and the Disabled People's Black Triangle protest group. Both of these groups are planning to be at the Tory Party Annual Conference in Birmingham this year, and to march along with thousands of other Trades Unionists, anti-poverty groups, etc., who are planning the biggest protest since the Poll Tax protests. One of the cartoons that depicted Clegg and Cameron with blood on their hands kept being forced off of Face Book, and then my account began to get hacked. Messages and postings were sent out, alledgedly from me, enticing people to connect to various spyware harvester sites, malware and spamming sites, etc. My password was changed and for a time I was unable to reconnect to my Face Book accounts page. I eventually decided to close the account for a period of time because it just became too time consuming, cleaning out all of the corrupt applications that were being posted on my Face Book wall by persons unknown. It's a strange coincidence that all this started to happen when I became involved in the anti benefit cut campaigns and started to create cartoons about Clegg and Cameron's roll in all this. Other people I know, who are also involved in the campaigns have also had similiar problems with their computers. A case of some creative hacking from some clandestine government department. Or just some malicious individual who gets his kicks from making trouble. Who knows? Has anyone else noticed that having adopted our social model language, the big charities and government departments have started to twist the wording around so that the 'problem' is back with us crips?! For example, a recent press release from the Department for Work and Pensions contains the lines: 'It is clear that the current assessments are failing to pick up on people with major barriers to work' (this refers specifically to Disabled people). Now we could be charitable and say that this misrepresentation of the Social Model concept is down to a lack of understanding and ignorance on their part. Or you could see this as yet another example of how 'they' are always going to label 'us' as the ones with the problem! Still don't get what's happening here?! Well, traditionally Disabled people have been seen as the ones with the problem and that we have to either be cured or fixed in some way in order to fit in with society. Along came the Social Model understanding of disability and the concept that 'it was society that was throwing up the barriers that disabled us' was introduced. As well as taking the 'blame' away from us crips it was now a much easier task to focus on society and identify and remove those barriers that were disabling us. Eventually this understanding was introduced into mainstream thinking and began to replace the Charitable Model understanding so loved by society and the many charities that had been set up to represent us, and also the Medical Model understanding which put the specialists in charge of our lives. 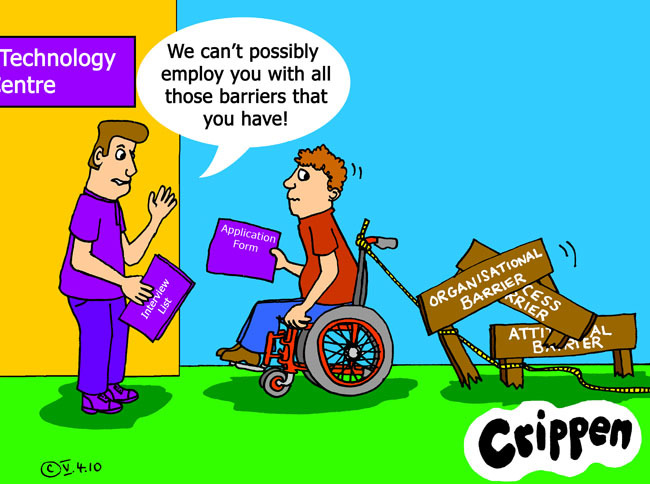 As I see it, this subtle change back to Disabled people 'owning' the barriers means that we've now come full circle, allowing society to opt out of its responsibilities once again and with us crips being at fault! Where do we go from here I wonder?! Hi folks. I'm starting 2010 as I mean to go on; gloves off and more in your face then ever before! I don't know about you but I'm getting pretty pissed off about the lack of any real progress regarding public perception of us crips and our role in society. It's still mainly those over paid non-disabled parasites who run those big organisations that have been set up to represent us (but without including us in their management) who are perpetuating the 'Tiny Tim' image that society has of us. Let's face it, it's in their interest to preserve the status quo of disability as without it, they'd all be out of a job. It's also in the interests of the various government departments that control our finances, job prospects, etc to let these sanatised organisations continue to represent us. Imagine what could happen if they opted to speak to real Disabled people? It might mean them having to get off their fat-cat arses and start to address some of the real issues that exist for us! And I also predict that you're going to see more Disabled people out on the streets protesting in the UK this year. Led by such organisations as the Direct Action Network (DAN) and some of the other larger groups of Disabled people, we'll be making our voices heard like never before. So, fellow crips and non-disabled allies alike, prepare yourselves. It's going to be a lively year!